Ai Video: How data is shaping loyalty 2.0? Are members of a loyalty program associated with a low-cost carrier also relatively low spenders? How to engage infrequent flyers and make the most of their everyday spending? Finding answers to such questions and in fact, even overcoming traditional ways of engaging and operating loyalty programs, isn’t an erroneous belief. Hong Kong Express Airways’ reward-U program is one such example. From no member, no 1st party data to 1 million members in 16 months to gearing up for loyalty 2.0, the journey has been quite an eventful one for this loyalty program. “Starting a loyalty program is always difficult considering that there is no data. But we are 16 months old now, we have been accumulating data, spending patterns etc. We are getting a picture of what people are doing. The association with a low-cost airline doesn’t mean that our members are low spenders. They are high spenders,” says Hong Kong-based CEO Steven Greenway. He spoke to Ai’s Ritesh Gupta about loyalty 2.0. Hear from experts about the futurel of loyalty at the upcoming 8th Mega Event Worldwide, to be held in Palm Springs, CA, USA (29 November – 1 December, 2017). Ai Editorial: Can airlines be an ally as a loyalty program operator? Are airline loyalty programs “trustworthy”? Are airlines content with lesser active program members? Do airlines only allocate the “lowest awards to seats they feel would otherwise go unsold”? Such questions gain credence going by the criticism of FFPs when one tries to assess the trust quotient. According to a study by Brandigo, around 60% of travellers do not feel loyal to any particular airline. The figure shows only marginal increment in loyalty among passengers who fly more than 7 times per year. If one tries to assess the level of trust via Google (search for “trust in airlines’ frequent flyer programs”), as per the first few links on Google, even without clicking on them, it is apparent that as an industry, airlines aren’t being trusted. A headline reads: Are airline frequent flier miles programs just rip-offs? Another link (from a piece posted by BoardingArea regarding Wyndham Rewards cancelling a promotion) explained the meaning of “trust”. “The legacy of being rewarded for distance travelled has set an expectation amongst customers which is difficult to reset,” an airline executive from Asia told me. Of course, certain markets witness more criticism of the way FFPs function. For instance, certain standalone loyalty programs in the U.S. may be touching a saturation point and the viability of accruing points/ miles in one currency with a particular airline is being questioned. Also, loyalty programs have been gradually evolving – take the case of transitioning to revenue-based model. “High yield customers will praise you for rewarding them equitably, whereas low yield customers will feel deprived – sometimes through no fault of their own, but rather due to competitive pricing amongst airlines on selected long haul routes. “Taking away” from loyal customers, even if relatively minor, can ignite a firestorm of opinions on social media platforms,” this is what a senior airline executive acknowledged as the airline chose to shift to a revenue-based FFP. 1. Offering a reward flight for non-travel purchases: Airlines are targeting infrequent passengers, and even introducing coalition loyalty programs. One way that is being attempted is everyday purchases points earning. So even as the lure of a free flight remains intact, the airline ends up remaining in touch, offers more ways to use or redeem a loyalty program’s currency. How do both passengers and airlines benefit? The major appeal of a coalition model is – the overall share of wallet. A person will spend a small proportion of their disposable income on air travel in a year. Adding credit card, supermarket, department store, petrol and other retailers expands the share of disposable income going through the program. With higher total spend within the program ecosystem more points are earned and so even the most infrequent traveller can attain those reward flights. Of course, the concept for rewards for everyday purchases isn’t for all. Some programs are devised for only frequent fliers. In this model there is less need for more partners as the vast majority of points will come from flying. 2. Making calculation simple and facilitating rewards: Can airlines understand the spending pattern and simplify calculation for a loyalty program member? If a start-up or a 3rd party FFP review site can explain airlines have a wide range of values even within one redemption category like flights, then why airlines can't do the same? Start-ups today are analyzing credit card spending pattern, sharing details of missed rewards and even offering personalised average reward value based on the rewards preferred by a spender! So, for example, if a user is part of an airline co-brand initiative and tends to use this card on certain categories and is eyeing a free flight, how can airlines assess the spending and come up with an apt recommendation? Can airlines highlight how values earned are calculated for each transaction and the value for what was missed by the member? As Connexions Loyalty recommends, airlines can experiment with varied offerings within various customer segments in order to comprehend who “values your brand, increase redemptions and reward your lost loyal customers”. 3. Avoid silo approach in a coalition loyalty program: Airlines, as program operators, need to consider the real-time quotient in passenger experience, and for this, all partners needs to deftly manage accrual and redemption of points/ miles in real-time (focus on their value, location, yield etc.) “(As an airline) Try to understand your partner’s (core offering and capabilities) and enable them to build their own loyalty accrual within your loyalty program, using your currency, says Piotr Kozlowski, VP Consulting, Services Sector, Airline/ Travel Loyalty at Comarch. He also asserted that every aspect of the program needs to be relevant, contextual – for instance, targeted promotions from a relevant partner, efficient use of APIs for quick integration to various systems, such as enrolment API, point – status check API etc. 4. Counting on mobile’s prowess: FFPs or loyalty initiatives should be crafted considering the prowess of mobile devices, and not merely be adapted for the same. For instance, how can loyalty program capitalize on mobile for real-time offers, personalised messaging etc.? How to make the most of Apple Pay and Android Pay, and interweave loyalty-related moves with them – say, the ability to earn and redeem rewards, and pay with a single tap? 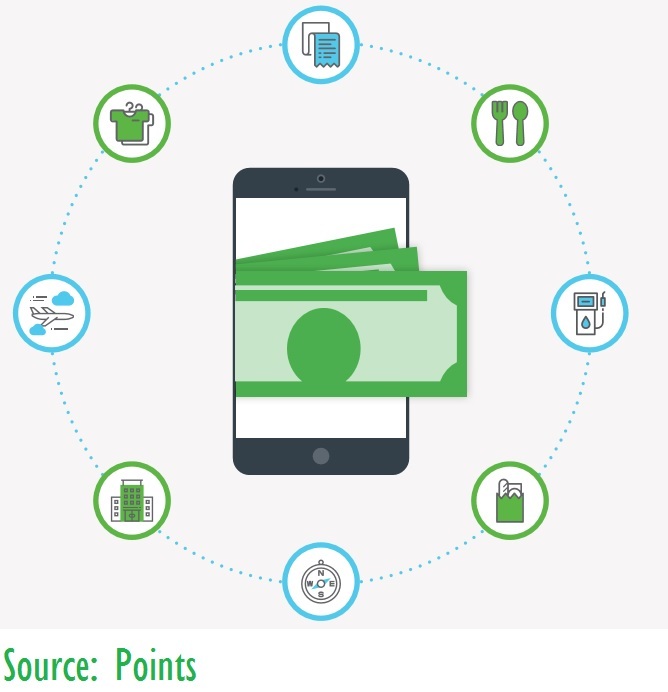 Can the currency of a loyalty program be used to pay for a transaction via a mobile wallet? 5. Overcoming loss of interest: Acknowledging that distant rewards can be discouraging and alienating to the program members, Comarch chose to combat such negativity and eventual loss of interest in the program. The company came up with their “Point Loans” option earlier this year, offering members a chance to avail a reward earlier than expected by “loaning them the fixed amount of points that are necessary to complete a specific redemption”. Comarch explained that this service can be “connected with a special fee that can be compensated in a form of money or points and needs to be repaid by the restricted deadline, otherwise either the member’s card will be charged or their account will be blocked”. Buying a book, paying for utility bills or car fuel etc via an airline loyalty card and getting rewarded isn’t new for customers. But partners in such coalition loyalty program need to move away from operating with the “silo” approach to making the most of emanating data in a collaborative and cohesive manner. Airlines, as program operators, need to consider the real-time quotient in passenger experience, and for this, all partners needs to deftly manage accrual and redemption of points/ miles in real-time (focus on their value, location, yield etc.) “(As an airline) Try to understand your partner’s (core offering and capabilities) and enable them to build their own loyalty accrual within your loyalty program, using your currency, says Piotr Kozlowski, VP Consulting, Services Sector, Airline/ Travel Loyalty at Comarch. Every aspect of the program needs to be relevant, contextual – for instance, targeted promotions from a relevant partner, efficient use of APIs for quick integration to various systems, such as enrolment API, point – status check API etc. “Data is a key enabler in taking the program forward,” agreed Kozlowski. A key aspect of data relates to crafting the profile of the customer, incorporating information about key traits like their shopping preferences. Be it for pushing the right ancillary product to a traveller or getting stock keeping unit data from the partner in the program, the benefits are immense and enables to build analytics, reports etc. This all can pave way for being a part of travellers’ lifestyle. “If you look at the travel-related coalition loyalty program, they are encompassing certain lifestyle (elements). By nature, travel brands tend to be premium brands. It is, of course, a kind of magic to match the high-street brands or online brands with the brand positioning of the program operator. The customer definitely wants to consolidate their commercial activity, especially pertaining to brands that inspire (or they aspire to have with them). Travel brands with premium or less premium brands on high-street is something that can drive the program forward (based on monetary-driven accrual levels). Managing a loyalty program, right from enrolment to sustaining a bond, calls for unremitting finesse. The circumstance or the outcome from a member’s perspective needs to offer some value – for instance, if you are collecting data for an unfinished profile, how about letting one indulge via apt mix of luring video, interface/ user experience that makes them participate, context that makes them feel “at-home”…so right from collecting data to analyzing it to coming up with a smart, targeted communication, what can sustain the efficacy of CRM is evolving. So what can make the journey, including data collection, an experiential one for members? Airlines need to look at how an interface, a piece of content or persona-based loyalty messaging can deliver. Incomplete profiles can halt progress. So clearly airlines need to maximize 1st party data collection. Considering that airlines need to gain intelligence from both homogenous and heterogeneous data sources, the significance of 1st party data acquisition can’t be undermined. In a recent webinar, Geoffrey Smalling, CTO, 500friends, a Merkle Company, mentioned that data needs to be collected “accurately, cleanly and at the right time”. He underlined the significance of garnering data from various sources – sales data, online, offline, CRM and social. “Collect as much data as you can – cheapest, since one doesn’t need to pay for it,” said Smalling. Airlines need to work on an enhanced customer view by linking multiple data capture methods. Identify high-value customers through attributes such as product purchases, preferences and demographics. Data collection can’t be mundane. The content, design/ functionality of the interface, timing, technology…can all of this captivate a user to take action? If we just talk of today’s smart devices, then one has to think of “glanceable” experiences, conversational interface, context of use etc. And how all of this can be used to improve profile of the member. So if a customer has enrolled, but not completed their details, how about looking at ways to reinforce the perks throughout a traveller’s first few experiences. If a customer has enrolled outside the shopping cart funnel, incentivise them for completing the profile. For example, invite them to do a secondary action. Using APIs and data tools to present a questionnaire that’s not checkbox and typical Q&A, and find compelling ways to collect more data. Smalling recommends that organizations can focus on channels easily accessible to members. This can pave way for pushing offers and act on persona-based messaging. This way one can connect at different times, and with limited friction for the member. Other than delivering real-time offers, this channel can be used for garnering engagement information on members. Retailers, airlines can make the most of queues, putting a spin around a mundane routine of shoppers/ passengers. A simple message to the shortcode, and chatbot comes into action. It could be about new enrolment or engaging a loyalty program member into an activity. “There are tools available for chatbots – not only work around the SMS channel, but also Facebook messenger, WeChat etc. This is a very low friction interaction, and apt way to drive the known customer rate as well as satisfaction,” shared Smalling, who highlighted that built-in artificial intelligence can understand data, parse user inputs etc. “It is about spending more personal time with them. It is about having a highly focused interaction.” Smalling also referred to the potential of mobile wallets – activating via email featuring a link or text message with a click button – as another option for low friction interaction. This platform can be used for personalisation – status update, a specific reward etc. Airlines can also look at social activity, and work on profiles of socially connected loyalty members. For airlines, the opportunity here is to count on an environment that isn’t a brand’s store, digital property or a hotel’s lobby. In order to make participants feel valued, companies can scrutinize social media posts using pre-defined criteria, and accordingly reward an individual. One can assess a person’s past interaction (for instance, activity on Twitter say hashtags, sharing of photo, joining of Instagram etc. ), and accordingly work out customized message or even (via integration with CRM/ loyalty database) pave way for points or engagement rewards depending upon the status/ tier today. A brand of Marriott’s stature is looking at combination of “automation, moderation, and surprise and delight” when it comes to social content. With robust data collection and analysis, one can focus on persona-based loyalty messaging (with details such as income, average order size, lifetime value, motivation - what triggers loyalty, drives choice etc.). “One can target a profile differently. This would mean highly-targeted, persona-driven loyalty,” said Smalling. Organizations need to be capable of managing robust data sets and knowing how to effectively segment and personalize for customers, work on actionable customer segments based on both transactional and behavioral attributes and events, personalise communications and experiences across channels to drive improved in-program participation and engagement. With highly-targeted, persona-driven loyalty, one can move on from being ignored or being marked as spam to being receptive to messages and notifications. Airlines need to excel on one or many counts - being an ally, being part of the lifestyle of travellers, holding high aspirational value, offering opportunities to a loyal passenger to maximize their loyalty rewards…and in order to accomplish this, one has to get closer to making every experience an experiential moment. When any airline prepares for digitization, the ambit of knowing the customer is going beyond interactions that take place with an environment owned by the airline. It isn’t easy for sure, but yes, it is being asserted that if airlines (or any business) intend to foster loyalty or sustain it, then customer experience isn’t just about interactions with a brand. If we talk of airlines, it is heartening to know the kind of effort that is being made - Allegiant Air pursuing ways to engage loyalty program members during the non-travel phase or Malaysia Airlines attempting to keep track of daily purchases by coordinating with online retail partners, via co-brand cards etc. Airlines have shown that genesis of digitization lies in digital transformation, as depicted by flydubai. The carrier has chosen not only relook at their IT architecture, but also refining their API connectivity to offer a connected, seamless experience. And of course all of this needs to be taken further with enterprise-level readiness. Then only any initiative, be it for one related to data, analytics and content management, can have direct impact on loyalty. · Data collection and integration: If digitization is about knowing and serving customers, then the initiative wouldn’t yield results if one can’t garner data from all disparate sources. There is a need to look at all acquired data in one place. Specialists recommend an audit of data sets, finalizing of a data model, evaluating mapping of data, and if all of this is consolidated via one dashboard, then it can lay strong foundation. How can one reap benefits? For instance, rather than ending up with “messaging overkill”, an airline can tailor messages as the booking funnel or preferred channel. Also, if we talk of artificial intelligence, bringing data together and integrating it is must. A central hub for data makes AI run efficiently - personalize, automate decisions, and analyze customer behavior. Just as AI is propelling the functioning of autonomous cars, robots and smart appliances, it can enable airlines to work on intelligent conversations across all of their devices. · Gearing up for new experiences: Any new customer-facing execution should run through relevant teams, and has to be purpose-built for enterprise requirements. Take the case of chatbots. They are omni-channel – can be set up where passengers already are (Facebook Messenger, mobile app etc.). Right from automatically recording and categorizing message successes and failures to ensuring how messages between users, bots and all enterprise systems are secured and exchanged in real-time to assessing the accuracy of conversation, every minute detail needs to be understood in a swift manner. This level of enterprise-level readiness is must for every interaction, every experience – relatively old or new. (On another note, airlines can also look at applications of such initiatives to improve their operations. For instance, the prowess of business intelligence can strengthened further by adding alerts and report delivery via a bot. A notification for a decision-maker via a bot, without the need to log into the BI system, can be quite useful). · Assess sensitivity of any new initiative: The idea of turning any consumer gadget, accessory or wearable into a payment device is luring. Turning any Internet connection into a commerce experience is exciting, but don’t forget that security of smart devices is still being questioned. Data breaches remain a big threat, and if IoT devices aren’t safe enough, then fraudsters will have avenues to potentially go after credit card numbers, login credentials, and personal details. · Build on efficacy of a proven channel/ touchpoint: Email id has proven to be a unique identifier, and travel marketers are looking at emails featuring item-level ecommerce receipt data. From online and offline receipts to travel itineraries and brand preferences, the inbox is becoming a go-to source for business intelligence Armed with rich, detailed data, airlines can attempt to understand where consumers are transacting, when they are buying, what they are buying, and how much they are paying. · Learn from what doesn’t work: The value of non-converting data can’t be undermined. Say a user visited a website, and left the site at some point. This user is being followed with retargeted ads, but didn’t convert despite showing early promise. Was there is anything wrong, say any unmet need, during the course of the booking flow or user experience on the website? Was the creative of retargeting enticing enough to get the user back on track? Non-converting data can help in areas like waste ad spend, frequency capping etc. for a marketer. Also, assess areas that the ad tech industry hasn’t found a solution for. For instance, overcoming limitations of dark social traffic channels. Dark social is when people share content through private channels such as instant messaging programs, messaging apps, and email. · Delivery of content: Content management, be it for going for an architecture that supports delivery of content for emerging technologies and all devices, adopting personalization rules that tailor a site content based on visitors’ profiles, or monitoring how content is performing, without navigating to a separate web analytics system, is one key area that is demanding action in a swift manner. Gain an insight into intriguing issues at Ai’s 11th edition of Ancillary Merchandising Conference in Spain this year. The sheer delight of being “valued”, taking family for special trips or the convenience quotient associated with travel are facets that loyal members, especially those belonging to the elite category, associated with travel loyalty programs. But changes in loyalty programs of established travel organizations in the last year or so, as witnessed in case of Starwood and American following Delta, United etc., have resulted in bad experiences as well as PR. There are elite “loyalists” with more than a couple of decades of association who have expressed shock, and are peeved with changes, for instance, raising of reward point requirements in case of Starwood. Come to think of airlines’ stickers and tags all over on your luggage, and suddenly you are left with only fond memories of all the perks you enjoyed, sad, isn’t it? · Why not leave “elite” members if everything is working well: Vicky Radke, Senior Director, Amtrak Guest Rewards at Amtrak, shared that when the organization last chose to re-launch their rewards program, the team relied on customer insights and “came up with measures regarding on how to base our success”. Amtrack decided to focus on increment in enrolment, in engagement and making redemption simpler. At the same time the team felt the need to take care of their elite customers – they know how your program works, what they want etc. So the team didn’t change elite benefits. “We made sure those customers still felt valued. Changes were made to simplify and streamline the program.” The team relied on both quantitative as well as qualitative research for the changes in the program. “Customers indicated that there was lack of understanding about how the program was working, and how they would get enough points to redeem. We used this focus group insight as well as member satisfaction scores to understand the opportunities we had to improve the program, and make the changes that would drive additional engagement,” shared Vicky. The key KPIs included over 15% in engagement, 25% in enrolment and also increase in redemption. · Feel the “sentiments” of a loyalist: One elite business traveller can’t digest the fact that Starwood made changes, and felt “betrayed”. For business travellers, FFP perks tend to be the number two reason just behind schedule that determine which airline the customer chooses (assuming they are not handcuffed by a corporate travel policy). Besides carrying around their elite status as a badge of honor, customers cherish the perks provided in order to alleviate the stress of business travel and they overall create a much more comfortable travel experience. At the airport, preferred check-in, expedited security, priority boarding all aim to make travelling more efficient. On board, upgrades to first class and/ or priority seating improve the comfort of the flight and provide more room to work or to relax. Additionally, when things do go wrong, elite customers know they are going to be given priority for customer service and rebooking. When all of this goes away, then it will result in acrimony. · Do communicate about the change and the future: I came across a post on LinkedIn that referred to Starwood making changes to their rewards program, but this elite member wasn’t informed in advance and got to know only after implementation happened. This member searched on Google but found no official announcement on the corporate site also. And then he goes on to add that the Marriott-Starwood strategic alliance only added to the woes, as perception around Marriott and their “limited room availability for reward stays” for business travellers wasn’t an exciting development either. As we explained in one of our articles, the old systems of airlines in the U. S. awarded both more award miles (used for free flights) and more status-earning miles to those who flew in premium cabins compared to those on cheap tickets. The problem with the old systems was that the “spread” or “differential” between cheap-fare earning and high-fare earning was minimal. In many cases as low as 1.5. That meant you really didn’t “much more” for spending more. So – to move to a more “revenue-based” earning system – the imperative was to increase the “spread” or “differential” to better reward high-fare customers relative to low-fare customers. This needs to be explained. Airlines also need to ease off the transition for erstwhile “high-value” travellers, especially not pushing them to do what all otherwise was part of the services for “elite”. For instance, don’t make your customers bounce from department to department in order to voice their dissatisfaction. Explain them the change when they get in touch. · Looking beyond “gaming” and looking at the profile of a traveller: Can airlines look at the way their “elite” customers reach the status and cut down on the possibility of grievances? For instance, a business traveller who ends up travelling from the U. S. to Asia several times a year and manages to achieve the elite status provided he or she is buying full fare or business fare tickets. This is fine. But there could be a traveller in the U. S. who travels domestically every week 1K miles each way, and takes off 4 weeks for vacation and holidays, and is now because of change coming short of the threshold necessary for elite status. So in this case can a certain mileage-run or sheer volume of transactions be considered, finding a way to differentiate between the genuine traveller and one who is finding a nefarious way to reach the status. Can aggregated behavioral spending data help in this case? FFPs should not react by copying a revenue-based accrual / earning structure of another FFP. Did United and American simply copy Delta’s program? FFPs must fully comprehend their own business model in respect of their revenue and cost structures, as evolving to a fully fledge revenue-based model (accrual and redemption) requires monetizing the value of a mile/ point – a critical success factor to maintain commercial sustainability of the FFP, which by default will impact all rates negotiated with long-standing accrual and redemption programme partners as a result of a previous calculated cost of a mile/ point. A transaction or an experience isn’t defined only by how a traveller interacts with a travel brand. In this context the worth of a co-branded card or a coalition program is on the rise, and airlines’ are trying to dig deep to ascertain what a loyal member looks like beyond their own purchasing funnel. Data and emanating insights is what one is after. In the whole exercise what works in airline’s favour is the lure of flights as a freebie or the overall perceived value. So today airlines aren’t just looking at the usual sources of data (behavorial, transaction, device etc. ), for instance, going beyond attribution models that only contribute in understanding a particular booking funnel. The plan is to identify ways to be more relevant by acting on data, not just when the probability of a conversion is there. Even in cases when customers aren’t regular buyers of an airline’s core products, airlines are finding ways to be a part of their lives. So be it for inspiring them to take their next vacation or evaluating their transactions, the ploy is to understand travellers when they are in the non-travel phase. · Elevating the brand with every transaction: The concept of a co-branded credit card isn’t new. But what’s novel is the way data is being collected, shared and acted upon. Yes, the role of partners is vital in a coalition program, but it is clear that air travel is among the most attractive rewards. Take the case of Allegiant Air. A major reason behind the US-based airline’s first-ever co-branded credit card, The Allegiant World Mastercard, introduced in conjunction with Bank of America few months ago, was to assert the brand’s presence in the lifestyle of the same set of travellers who fly with the airline once-a-year. “The play for Allegiant in the future is that we have the most powerful redemption opportunity – easy, affordable access to exciting destinations, very “aspirational” the kind of place travellers think of day-dreaming,” says Brian Davis, VP Marketing and Sales, Allegiant. The plan is to interweave this with the day-to-day lifestyle of travellers – gas stations, grocery stores etc., making Allegiant brand part of those transactions. “So as customers go about mundane transactions, they day-dream about their next travel and destination,” said Davis. As for the travel and benefits, some of them include priority boarding, free in-flight beverage when the cardholder shows their card, Buy one, get one free airfare when the card is used to purchase an Allegiant vacation package with 4 or more hotel nights or 7 or more rental car days etc. · Engaging during the non-travel phase: David referred to the low frequency model and the significance of the seasonality factor for the leisure traveller. “Most loyalty programs are crafted around high frequency travellers, business travellers, and these aren’t usually on our airplanes. It’s more of once-a-year vacation family travel. The program is relatively new, set up right from the scratch, so it will result in more and more insights into their lives,” he says. As Davis says, the focus is now to be a part of their lives once the actual travel phase is over. The lead customer – around 80% of the total buyers – is typically the housewife, who is in late 40’s, has two kids, and she is in charge of the family vacation. While there has been scrutiny of the decision to charge $59 annual fee, it is clear that Allegiant is banking on the initiative for evaluating everyday purchases. Davis explained that the airline’s relationship with their customers tend to be once-a-year when the traveller takes the vacation, and then they go back home, living their respective lives, the other 51 weeks of the year. Insights about those 51 weeks – who they are, what motivates their purchases, how they eventually spend money etc. becomes very important. · Insights from data and acting on it: A coalition program can result in tangible benefits - expand member base, decrease marketing cost, cross-market to each other’s members, what products to push etc. Overall all can get better at doing analytics, as there is an efficient dataset. So rather than only relying on model section, the quality of data and size of data comes into play as well. One can also look at the merchant-fit in terms of what is that your members are likely to respond to. So choose a loyalty program partner as per the behavior of the member. For instance, the data analyzed over a period of time indicates that a particular member whenever travels with a family doesn’t hire a car, and rather prefers public transportation. Why not to offer a relevant ground transportation deal for the entire trip, say when a traveller is going to Switzerland, then why not offer a discounted pass for the duration of the stay? So do plan to influence the customer touchpoint, and be meaningful to them by indicating you know them, by making an effort to surprise them, delight them with a utility-oriented relevant, attractive (discounted or contextual or any other value etc.) offering. Davis also acknowledge the utility of such data as the airline is now evaluating the non-travel phase behavior – what kind of stores they shop at, what kind of restaurant do they eat at etc. “It would be about building offerings around our customers. Data has played a big part in where we are today (with our loyalty program), but we have just started out this initiative,” he said. It is of course very challenging to merge all data points, apply the right algorithms and have the right text and visual components come together to create a seamless flow of information to members. · Product and customer experience: “This foray into the loyalty space is all about understanding the customer first, and building the right product for them. The team at Allegiant counted on data to understand passenger profile, travel pattern, and how Allegiant is different as a carrier from others in this context,” shared Davis. Mechandising is a journey, and so is crunching the data, so how is the airline looking at taking customer loyalty to the next level? “It (co-branded credit card and data from the initiative) allows to shape up our business – what other ancillary products we need to bring on, and how should our partner mix needs to look like, as we build the business around the customer,” added Davis. Ai is scheduled to conduct 2nd Co-Brand Partnerships EMEA conference in London (22nd February). As a traveller, how would you define your experience – satisfying, extremely annoying, wonderful…? Evaluating such emotional reaction can be an arduous task for an airline. It’s becoming increasingly important for travel brands to deliver a connected experience, and for this there is a need to integrate touchpoints, context and also refine the ability to optimize workforce and processes. So how to get closer to knowing the customer as well as the emotion associated with their journey/ lifecycle? Specialists point out that the answer lies in knowing the data, but it is easier said than done as one needs to bridge the gap between data and human emotion, which is a sum of multiple interactions (emanating from multiple devices, sessions etc.). So how to bridge this gap in the connected consumer journey? The answer lies in working on a single source of truth about the traveller – it is still a work in progress. But one thing is for sure – one needs to gear up for today’s connected era. An era in which airlines need to count on both historical and real-time data (what is happening now) in their data center, via the cloud. · Connectivity: “Be your own API,” this statement during one of our conferences in Kuala Lumpur last year is a testament of the fact systems that airlines operate can no longer be “closed”. APIs are integral part of any data-centric organization as a layer of API paves way for technology integration. It is vital for vendors to gear up for open API to facilitate connectivity or integration with other programs. Airlines are becoming more customer-focused and are attempting to effectively use the customer data which they already have, but the processing of the data and on-request real time usage is definitely a challenge. It is especially a problem of data integration from different systems based on completely different philosophy and aggregation methods. “I would find legacy PSS systems as a major obstacle in getting quick and well aggregated customer view as it requires complicated interfacing which may impact data accuracy and reliability,” says an experienced e-commerce executive. Now evolving from a PSS to a new version isn’t easy, but as shown by the hospitality sector, time has come for systems to be designed for true cloud environment, for instance there are hotel systems with full PMS (property management) functionality as well as API connectivity for other companies to integrate within. · “Actionable” data: Airlines, just like retailers, need to garner and assess the rising amount of data on a continuous basis, turnaround the same into actionable intelligence in order to improve customer experience as per their booking journey or their respective customer lifecycle. Airlines have to gear up for various data types and vast volumes of data – manage volume, the response time, structured and unstructured data such as text, sensor data etc. The quality of data lays a strong foundation. Organizations must consider latest cloud native big data services to tap into for all kinds of common data use cases. Experts say one can start modeling and analyzing data sets in minutes. There are enterprise-level open data platforms that are capable of releasing actionable intelligence from all data: data-in-motion (the process of analyzing data on the fly without storing it) and data-at-rest (data stored on a hard drive, archived etc.). Use cases include algorithms that spot where travellers are in the lifecycle and then evaluate the chance of conversion, defection, or inactivity; geo-relevant shopping recommendations, for instance, a voucher for lounge at the airport depending upon the shopping behavior shown on airline.com or even app post booking etc. ; predicted future value for every single traveller etc. · Cloud: There are questions related to cloud/ platform as well – how to make the most of Hadoop open source programming framework? How to integrate the same with existing enterprise data? How to set up business intelligence applications? The role of a platform can’t be undermined as it allows to connect, secure, mobilize, share data, and get insights across applications. The platforms need to support enterprise-level configurability to meet business needs. Nowadays platforms are being driven by cognitive capabilities to integrate all data sources on one common platform. Companies like IBM have worked on offerings that allow deployment of data assets in an automated manner, and leverage an open ecosystem. To serve customers better, such platforms should facilitate continuous refining of omnichannel customer data profiles and should be handy for all sorts of customer campaign and engagement. This should include all interactions from digital, physical, and mobile channels. And eventually machine learning and predictive models should be able to enhance the relationship. · New technology: Technology and its use tend to move faster than airlines, hotels etc., so the travel industry needs to respond in a swift manner. For instance, the potential of IoT commerce requires airlines to embrace mobility, connectivity and IoT thought processes and strategies. As highlighted in one of our recent articles, in the airline environment, IoT can connect travellers’ baggage to their mobile device for real-time tracking and updates. It can create verified IDs from distributed documents, speeding the process of passing through security, customs or boarding a plane. It can be used to provide real-time alerts about flight changes, status updates or emergency notifications. Airlines need to prioritize and re-look at their systems around payments, data collection, data integration, security and other activities. Instead of storing data in separate silos or divisions, the IoT assumes that data can be accessed and acted upon in real time, regardless of where it originates. Are airlines looking at this aspect of their IT infrastructure? IoT cloud service are being used to streamline management - connect devices to the cloud, analyze data in real time, and integrate data with enterprise applications, web services etc. Once an organization is in a position to capitalize on data from any source—cloud, on-premises, big data repositories, IoT etc. then only one can think of being in control, and getting closer to knowing the emotional reaction, and possibly the reason behind it. Each email address is a unique identifier, and can pave way for creation of targeted profile and personalisation, says Dwight Sholes, ‪Senior Consultant, Travel and Hospitality, Return Path. Email can result in winning over micro-moments, an aspect that is so crucial today in the fragmented travel planning and buying journey. From online and offline receipts to travel itineraries and brand preferences, the inbox is becoming a go-to source for business intelligence. In fact, email today offers value beyond marketing. A frequent flyer program might undergo a major transformation owing to accounting and liability pressures, but if the redemption rate isn’t up to the mark, then the whole point of creating an aura around a brand and boosting loyalty is missing. Yes, loyalty programs aren’t the same anymore, especially with the advent of spend-based models. Airlines are grappling with pertinent issues today - have frequent flyer programs become too transactional in nature? Are infrequent travellers or relatively “low-spenders” being alienated? Is the redemption rate of airlines’ loyalty programs taking a beating? Airline executives themselves acknowledge that the legacy of being rewarded for distance travelled has set an expectation amongst customers which is difficult to reset. The commercial benefit of changing to revenue based rewards is just too great for program’s to ignore. So if travellers aren’t redeeming miles accrued, then they are not actually engaged. As highlighted by 500friends, a Merkle Company, there is a need to engage leisure travellers, a segment that is being “overlooked”. Airlines need to minutely assess how to improve upon the redemption rate, evaluate an appropriate benchmark for the rate that fits their business, and also avoid too much focus on short-term margin and direct revenue. Ø Assess the utility of everyday spend: The option to be rewarded from everyday purchases has opened up the realms of the FFP to the infrequent traveller. As per the current trends in the digital loyalty commerce arena, as indicated by a survey conducted by Collinson Group, members appreciate the ability to earn points on everyday spending. Around 46% of respondents mentioned that they liked this feature about their airline loyalty program. “Expanding the potential and the velocity of earning means more travellers can participate and get real benefits from a program. Most retail and financial card earn options are already spend based so are a natural fit with spend based airline points,” says Nik Laming, General Manager - Loyalty at Cebu Air Pacific Air. Ø Perception – getting it right: According to Collinson, two major challenges with loyalty programs are availability and affordability of the rewards. Perception of the value of a programme’s currency continues to be an issue. As per one of the studies last year, Collinson found that over 50% of survey participants didn’t expect that they would “ever be able to earn enough points to redeem anything of value”. According to 500friends, airlines need to identify gaps that exist in rewards structure. Leisure travellers are earning fewer miles than they did in the past and without mile-attainability driving their loyalty, travellers start “focusing more on price, convenience, service, and other factors to choose their carrier”. So these need to be included more in the program structure so that members end up perceiving adequate value. Loyalty program need to offer something substantial – a sense of instant gratification, and aspirational value, too. Ø Count on the power of coalition: A coalition program of organisations with differing purchase cycles, margins and customer emotional attachment can be very powerful. While a program does away with the limitation of only offering a limited range of rewards, adding credit card, supermarket, department store, petrol and other retailers massively expands the share of disposable income going through the program. The reason a coalition model appeals to infrequent travellers is simple - share of wallet. A person will spend a small proportion of their disposable income on air travel in a year. With higher total spend within the program ecosystem more points are earned and so even the most infrequent traveller can attain those reward flights. Ø Count on data: More tailored the offer, more the chances of redemption. Airlines are looking at their members’ demographic, behavioural, and tier data. Attempt is being made to understand members better by profiling and segmenting them not just based on tiers but also their airline and non-air preference and behavior. “Airlines need to work on data-driven offers ones that pave way for context-sensitive merchandising and understand the pain and joy points in the journey,” shared an executive. The loyalty technology are constantly being developed and enhanced to ensure the real-time data are captured and further manage members’ experience in ensuring miles are credited timely. Plus, there is a need to work with strategic partners to study daily transaction behavior e.g. banks, petrol, online retailers to provide more value to members. Of course, a major challenge today is whether airlines are capturing enough data. “As much as we captured the flying data; but there are elements of daily purchases such as co-brand cards/ financial partners/ petrol partners/ online retailers partners that we need to capture and able to monetize our members with value added rewards,” shared an airline executive from Asia. Ø Keeping it simple and communicating well: How to redeem against your loyalty program should be easy enough to understand. Also, if a member is inactive, then airlines need to identify appropriate reason or context, and present themselves via a push notification or an email. Be it for an email about long-forgotten points, or pushing offers and rewards via one’s preferred channel in real-time, such initiatives can take a member closer to redemption. Location based triggers, too, can work. According to one of Sweet Tooth’s recent blog posts, a case study about Expedia+ indicated that the program does create a web experience that is fully committed to member recruitment. But there is lack of clarity about how it works, and expiration dates are “hidden”. Ø Evaluate online activity: According to a study by Sweet Tooth, actions that encourage a member to engage with a brand’s social accounts “have a larger impact on average redemption rates than any other action”. · Programs that are rewarding for Instagram follows have a redemption rate that is 7.76% higher than average. · Ones that reward for Twitter follows are 16.39% higher than the average rate. This is likely due to increased brand exposure.